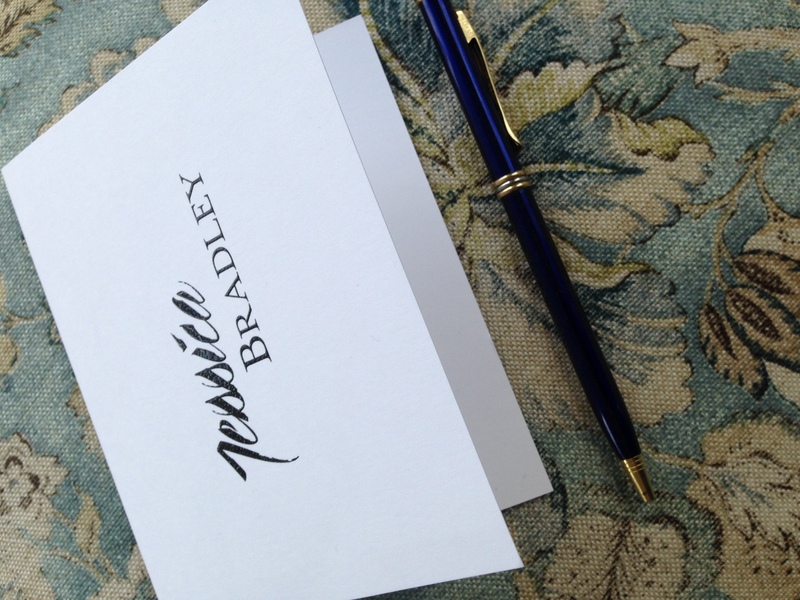 In the coming weeks, we will be launching an exciting new line of stationery. These exclusive designs are unlike any others on the market right now, and we are so proud to offer them to you. The Ovation Note is one of them. 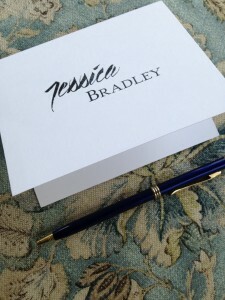 This folded note features two beautiful lettering styles: the first name is an exclusive calligraphy font and the last name is a more tailored serif font. 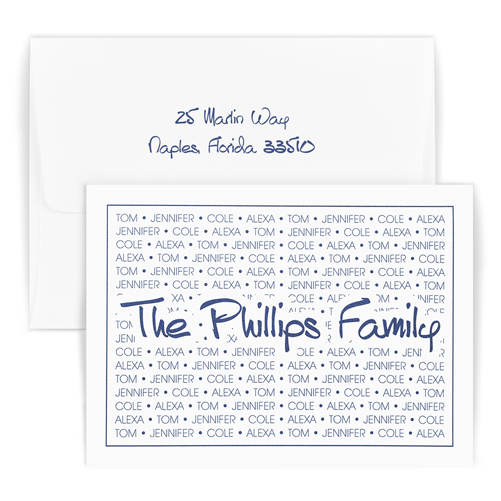 These lettering styles coordinate beautifully and add interest to traditional personalized stationery. Choose your favorite ink color on your choice of ivory or white paper. The raised ink, also called thermography, adds delightful texture and a shimmery shine. The double-thick paper has a pleasing weight and is crisply folded, offering you three panels of writing space. As with all of our stationery, 50 Pinnacle envelopes come with the 50 notes. You can specify an optional matching or contrasting border for extra interest. 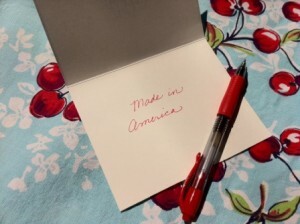 Other options include hand-inserted linings and return address on the envelopes or 100% cotton paper for even more luxury. 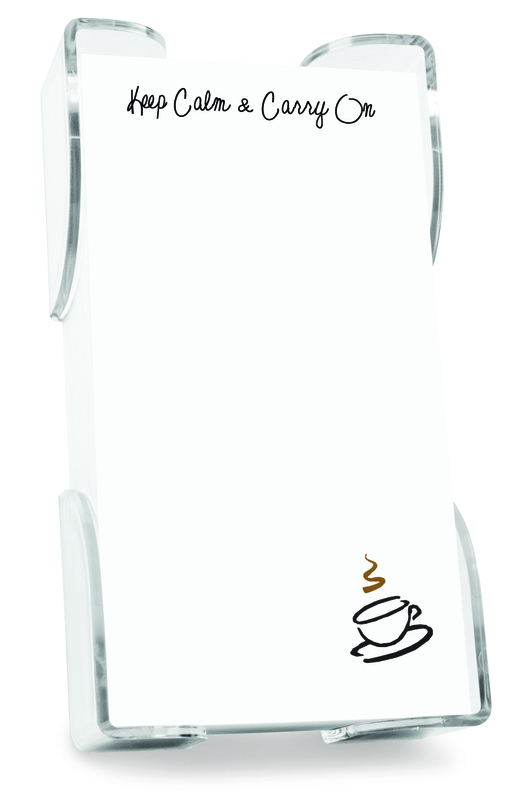 Come back and see the Ovation Note and more than 2 dozen other exclusive designs in the upcoming weeks. Our stationery is made in America. We produce your order from start to finish in our facility in Aurora, Illinois. It’s no secret. And it’s why we can produce your order in 24 hours. No middle men or vendors slow us down. That’s not the case at other stationery companies. Some import their products. Very commonly, some companies pair imported white envelopes with their cards or notes. We make every single card or note and the matching envelopes right here in our facility. When you select ivory paper, you get matching ivory envelopes. When you select white paper, you get matching white envelopes. We can spend time and care on these details. And, we go the extra mile. We can do so because all of our materials and craftspeople reside in the same building. In addition, we stand behind our products…because we literally stand behind our presses and other machines. Each of our highly trained staff carefully crafts every order. They take the necessary time to produce every piece of stationery or napkin to the highest standards.They re-do the project if needed. We want you to be 100% satisfied. It’s very rare, but if you are not, we will exchange the product or refund the purchase price. American precision, and American accountability. See our Greatness Guarantee. Our people are our most valuable asset. Many of them have worked for us for 20 or even 30 years. We take great pride in this fact. Even most of our raw materials originate in the U.S. When you order a Giftsin24 product, you support American jobs and the American economy. Thank you for your support! 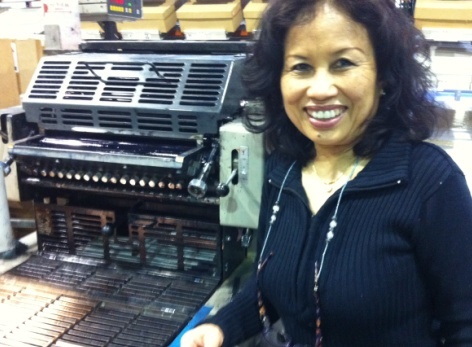 Vicky, who runs our printing facility, enjoys working on the thermography machine. Ever wonder how our raised ink stationery is printed? We take great pride in creating crisp, vivid, highly textured printing that’s as luxurious to feel as it is eye-catching to see. We create our raised ink printing through a technical process called “thermography.” Vicky, who manages the Giftsin24 printing facility, explained the process. Out of all the equipment in our state-of-the-art factory, the thermography machine is Vicky’s favorite one to work on. She enjoys the magic of the process and the vibrant, shiny results. Some of our products feature just a touch of raised ink; others go all out. The Anthony Family Pride Note is a delight to touch because of the abundance of raised ink printing. One of our favorites that pulls out all the stops is the Anthony Family Pride Note. The texture of the raised-ink names, bullets and border makes this note a delight to touch and hold. Like most of our raised ink products, you can choose from among our 10 raised-ink colors. A young, close-knit family would love this gift. Do you have a favorite raised ink product at Giftsin24? Leave a comment in the box below to tell us about it! On July 4th, we celebrate our country and all it means to us…its beauty, opportunities and freedoms. We are proud to be an American company. This year, we are also celebrating our 40th anniversary in business! We are a leading manufacturer of social stationery right here in America. When you buy from our American company, you support the domestic economy and workers. Here’s an example: When you purchase our products, your money pays the salaries of our workers at our Aurora, Illinois, facility in America’s heartland. We also pay our suppliers, like Wisconsin-based Neenah paper and FedEx. Our workers, our suppliers, and our suppliers’ workers further circulate this money throughout the economy, when they buy food at the grocery store and pay taxes that support schools and libraries or infrastructure like roads. Over the past 40 years, while our business has seen its ups and downs, American manufacturing has shrunk dramatically, shedding good-paying jobs in the process. We are one of the survivors. As the country struggles with an anemic recovery from the 2008 economic recession, people wonder how to create more American jobs. Consumer power is one way. This year, retail giant Walmart pledged to stock more US-made products in its stores, for example. If consumers buy more American-made products, companies can afford to hire more workers and invest in their businesses. Hopefully their success will encourage new manufacturing companies to start up, providing more jobs and fueling the economy. American companies like ours abide by fair labor laws. We also conform to EPA regulations. You can rest assured that workers are being treated fairly and that the environment around our manufacturing plant is not polluted. These safeguards are often absent in other countries. Companies there may make products more cheaply, but at a terrible cost to workers, nearby residents and the environment. We hope you’ll agree that American-made products are the best ones. Thank you for your support.